1) The wide angle G lens is Great, with the letter G. My FX1 wide angle lens is heavy and will stay on the FX1. 1) Must remove battery to charge it. Will not charge on the camera. 2) When the camera is hooked up to AC, the battery must be off the unit and if you should lose AC, then no power. using a single beam of light. Color TV came along using only three colors to trick the eye into seeing many colors. never be any better than the day it was birthed, but then I accept that fact and would not like to change it if possible. I want to see the Wright Brothers take off in slow frame B&W, not in 3D. My name is Curtis Anderson. I am a 62 year old retired electronics/communications technician. I started shooting videos in 1972 using a Bell&Howell Super8 asa-100 color film video only( no audio) camera. In 1985, I upgraded to a RCA-VCR tape video camera. In the 1990's I moved on to Super8MM and HDV camcorders. Today I continue to upgrade my equipment, keeping all pervious cameras and equipment in working order. I feel I have a keen eye for video quality and a good understanding of video content, formats, performance. Copyright © 2010 www.wcast.info - All rights reserved. Disclaimer. Next to the battery, are two Memory Stick slots, stacked vertically. These Memory Stick slots also accept SD cards. Memory Sticks face to the left and inserting SD must be inserted facing right. If you insert a memory card into the slot in the wrong direction, the memory card, the memory card slot, or image data may be damaged. When the access lamp is lit or flashing in red, your camcorder is reading/writing data. Do not shake or knock your camcorder, turn the power off, eject the memory card, or remove the battery pack. Otherwise, image data may be damaged. If [Failed to create a new Image Database File. It may be possible that there is not enough free space.] appears, then, format the memory card. When inserting or ejecting the memory card, be careful to revent the memory card from popping out and dropping. Insert memory cards each in both slots A and B, so the camcorder switches memory card A (or B) just before space on the other one runs out, and continues recording on the next memory card automatically. Do not eject the memory card that is currently being used for recording. Replace only the memory card whose slot lamp is off. Even if you press the memory card slot button, A or B, while recording movies, you cannot switch the slot currently being used. When the remaining recording time of the memory card being used is less than 1 minute and the other slot has recordable memory card inserted, [ ] or [ ] appears on the camcorder screen. The indicator turns off when the memory card is switched. 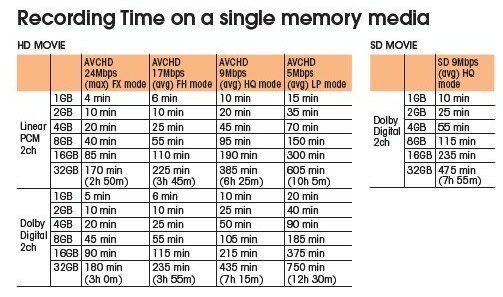 If you start recording on a memory card with the remaining recording time of less than 1 minute, the camcorder may not be able to relay-record. To relay-record without fail, make sure that the memory card has more than 1 minute when you start recording. Seamless playback of relay-recorded movies with this camcorder is not possible. You can re-combine relay-recorded movies using the supplied application software (Windows only). You can attach a flash memory unit HXRFMU128 (sold separately) to your camcorder for recording movies. To remove the flash memory unit, turn off your camcorder, and while sliding the RELEASE lever in the direction of arrow, remove the flash memory unit. When you do not use an flash memory unit, leave the flash memory unit jack cover attached. When the access lamp is lit or flashing in red, your camcorder is writing data on recording media. Do not shake or knock your camcorder, or remove the battery pack or the AC Adaptor/Charger. Your camcorder can record movies for about 13 hours. If a movie file exceeds 2 GB during recording, the camcorder divides the file and create a new file automatically. The menu settings, the PICTURE PROFILE settings, and the settings made by the AUTO/MANUAL switch are stored in your camcorder when you turn the POWER switch to OFF. The access lamp lights up while the settings are being stored. If you remove the battery pack or the AC Adaptor/Charger before turning off the power, the settings may return to the default settings. Sony specifies PRO Duo Mark 2, PRO-HG Duo, and PRO-HG Duo HX. For SD and SDHC, Class 4 or higher.